Washington, like all states, can replace its two statues at the U.S. Capitol every 10 years. UPDATED: Sun., Feb. 3, 2019, 1:34 p.m. The statue of Marcus Whitman seems likely to keep its hallowed spot in the U.S. Capitol’s Statuary Hall, despite a state Senate proposal to replace it with someone who could pass a more rigorous, objective review. While critics might say that would actually be a more 21st-century subjective review, one point of Sen. Reuven Carlyle’s proposal is worth discussing, even though his bill seems to have about as much life as the statue. 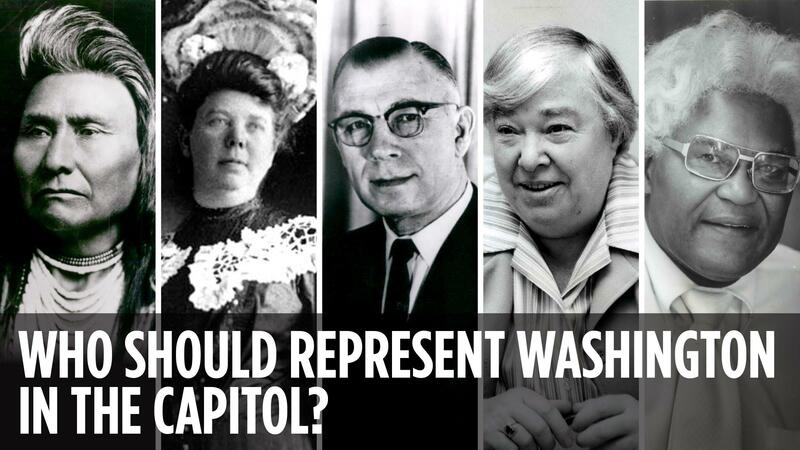 Who would best represent Washington to the millions of visitors to the U.S. Capitol each year? Like all states, Washington gets to put two statues in the U.S. Capitol. Whitman, a pioneer minister, doctor and educator, has occupied one of those spots since 1953. Mother Joseph, head of the Sisters of Providence order that built schools and hospitals in the early days of Washington, got the other one in 1980. There’s a nice symmetry to that duo, considering both had religious, health care and educational cred. Whitman lived (and died) near Walla Walla, but he can’t really be called an Eastern Washingtonian because such a distinction didn’t exist back then. The nuns built stuff all over the state, so there’s none of that Cascade Curtain rivalry. On the other hand, neither is a Washington native. Momma Jo, as probably no one called her, was born in Canada. It’s not clear if she eventually became an American citizen, although considering she died before women had the right to vote and the Border Patrol was not doing immigration spot checks of stage coach passengers, her citizenship might never have come up. States can swap out their statues in the Capitol every 10 years. The Whitman statue isn’t the oldest resident of Statuary Hall – Vermont’s Ethan Allen statue and Massachusetts’ Sam Adams have been there since 1876. But if it were a person, the Whitman statue would be eligible to retire and start taking full Social Security this year. Other states have updated their statuary in the past 39 years, the most recent being Arizona, which swapped one of its statues for former Sen. Barry Goldwater in 2015. So if the state were to retire Whitman and Mother Joseph – setting aside the argument of whether it should – who should take their place? Spin Control consulted longtime friend and colleague Jim Kershner, who writes for History Link and the daily history column in The Spokesman-Review and thus has a better grasp of Washington’s storied past, to come up with some suggestions. He helped come up with a list to start the conversation. Considering there is a noticeable shortage of Native Americans in the hall – just four out of 101 (the District of Columbia gets a statue) – Washington might consider some of its notable indigenous people, like Chief Seattle, Chief Joseph, or, if we want to come into the modern era, native rights activist Billy Frank Jr.
Congress being what it is – full of politicians – the state could come up with some of its own elected officials to cast in bronze or carve into marble. Two Washingtonians who spent the most time in those hallowed halls were Warren Magnuson and Henry Jackson. Their statues probably should be decorated with gold leaf to honor their ability to bring federal money to the state. Republicans might balk at sending two Democrats. A good case could be made for Republican Dan Evans, the only person to serve three terms as Washington governor, except for one small detail. Evans is still alive, and being dead seems a qualification for being in the hall. Gov. Dixy Lee Ray might not be the most popular of Washington’s chief executives, but she was only the second woman in the United States to be elected governor who wasn’t the wife or widow of a previous governor. She, too, is a Democrat, but supporters of President Donald Trump might like her. She fought with the Legislature and the press, even to the point of naming pigs on her Fox Island farm for unfavored reporters, and sending them sausage from their namesakes when the animals were butchered. A good sculptor could probably work in a piglet at her feet. Environmentalists and civil libertarians might go for Supreme Court Justice William O. Douglas, who was raised in Yakima before going off to Yale. Spokane might have its favorites to throw into the mix. Civil rights activists might call for a statue of Spokane attorney Carl Maxey, a pugilist in the ring, the courtroom and on the front lines of equal rights. Those who think women might be better represented in Statuary Hall as well as in Congress itself might back suffragist and civic activist May Arkwright Hutton. Most of the people in the hall might evoke a “Who dat?” response from folks outside their sponsoring state, and a few might not be well-known any more back home. Washington could make points with visitors by sending one of its more universally recognized favorite sons, like Jimi Hendrix or Bing Crosby. As the country ages, more visitors might recognize the guy with the guitar than the guy with a pipe. Businessmen, also known as captains of industry when they are cast in metal or stone, might also get some consideration, particularly for a state that has changed significantly in recent decades. For aviation, it might consider William Boeing; for software and everything that he did with the money he made on it, there’s Paul Allen. If Carlyle’s goal was to spark a conversation, the bill’s likely demise is all but certain to stifle it in the Legislature. But readers could keep it going. Just send your nominations by phone or email for the best subjects for a Washington spot in Statuary Hall, and we’ll compile a list in the future. Published: Feb. 3, 2019, 5 a.m. Updated: Feb. 3, 2019, 1:34 p.m.